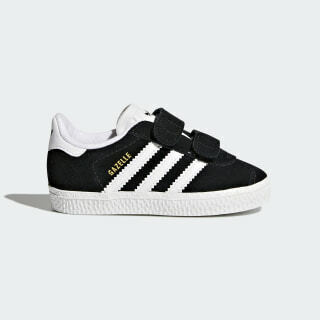 Toddlers' Gazelles with hook-and-loop straps. The original Gazelle made in the '60s for soccer's quick stop-and-start moves became a wildly popular streetwear style icon. These toddlers' shoes are designed for speedy transitions with straps for fuss-free on and off. Made from suede and adorned with a metallic gold "Gazelle" atop the 3-Stripes.